Perfect for the most strength demanding and protective end user applications. 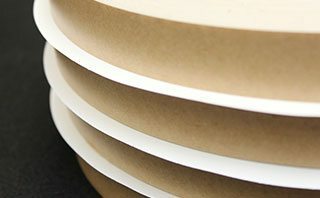 RAETON™ laminated products are typically paper / film / paper and the resultant characteristics exceed the properties of the individual components prior to them being combined. Thus, RAETON™ products are used for the most strength demanding and protective end user applications. Due to the true paper surface of RAETON™ products, they can easily handle single and multi-color printing via the widest variety of traditional printing processes, deep embossing, foil stamping, gloss coatings, clean die-cutting, perforating, and gluing. It prints and handles just like paper because it is real paper. RAETON™ durable papers are fully compatible with all digital print techniques including: B & W, full color laser, ink jet, and all other web or small format presses. Manufactured to exacting relative humidity and flatness specifications, RAETON™ products exhibit unparalleled dimensional stability, exceptional consistency, high speed performance in pressroom, converting, and office environments. Silicone release boxes are typically in a hot pour application where the contents will solidify.